Favorite beverage: A beer, Guinness, as long as it is poured correctly. Dr. John J. Medina, a developmental molecular biologist, has a lifelong fascination with how the mind reacts to and organizes information. He is the author of the New York Times bestseller Brain Rules: 12 Principles for Surviving and Thriving at Work, Home, and School — a provocative book that takes on the way our schools and work environments are designed. His latest book is a must-read for parents and early-childhood educators: Brain Rules for Baby: How to Raise a Smart and Happy Child from Zero to Five . Medina is an affiliate Professor of Bioengineering at the University of Washington School of Medicine. 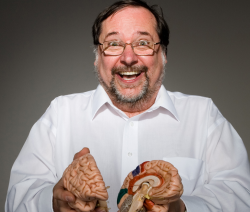 He is also the director of the Brain Center for Applied Learning Research at Seattle Pacific University. Medina lives in Seattle, Washington, with his wife and two boys.